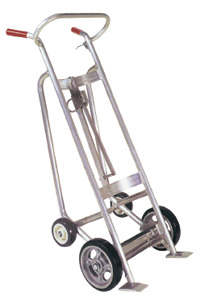 Standard 2-wheel drum trucks provide easy maneuverability and complete operator control even on ramps or inclines. 2-wheel design allows operator to vary the angle of the load for the most convenient operating position. 4-wheel trucks carry the entire weight of the load on the wheels to reduce operator stress and fatigue. 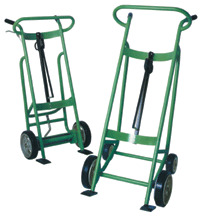 4-wheel trucks allow a 1,000 lb. load to be tilted back for pallet loading and unloading. 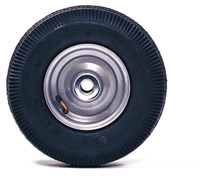 Roll easily over rough or smooth surfaces 12" x 3.5"
Solid rubber, permanently bonded to aluminum wheel - 10" x 2.5"